Sydney, Australia: Highly-stressed rock and six brick-lined rail tunnels complicated a deep excavation in Sydney's central business core. 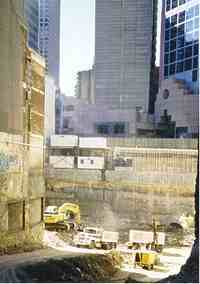 The project involved the removal of 100,000 cubic meters of sandstone for the basement of Genting Centre. Previous excavations in the area produced deformations of up to 1 mm per meter of excavation and caused damage to buildings and rail tunnels. The damage was believed to have been due to the relief of relatively high horizontal stresses in the rock. The average depth of the Genting Centre excavation would be 30 meters, extending to 36 meters at one location, so there was great potential for damaging deformations. 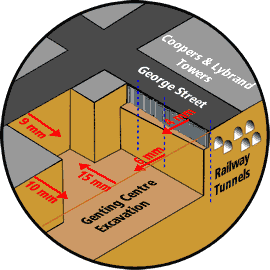 In addition, the George Street face of the excavation would approach within three meters of the nearest rail tunnel. Authorities placed strict controls on deep excavations in the area. In particular, the Rail Service Authority stipulated that their tunnels must be monitored during excavation and that displacements between the tunnel walls must be limited to 10 mm. The RSA also required the developer to post a substantial bond to cover the cost of repairs should the tunnels be damaged. Recognizing the need for a geotechnical and civil engineering consultant, the developers retained Golder Associates, who had already conducted geological investigations and stress analyses at the site for a previous proposal. Golder Associates developed a geotechnical model to predict the field performance of the rock and the retention systems, advised on excavation and underpinning methods, evaluated design parameters, and implemented a monitoring program. The aim of the analyses was to provide guidance to allow efficient and safe excavation of the basement. The excavation took place over a 12 month period. The George Street face (adjacent to the rail tunnels) was retained by an anchored contiguous bored pile wall to about 8 meters depth. Permanent support in this zone will be provided by floor slabs. Below that depth, a system of ground anchors and rockbolts was used. Elsewhere, the building is to be constructed independently from the excavation. Temporary support was provided by an anchored soldier pile and timber lagging system. Below this, support was provided by a combination of rockbolts and 75mm-thick, mesh-reinforced shotcrete. A total of 1,000 fully encapsulated rockbolts were used to provide long-term support. Surface survey points were set up around the perimeter of the excavation and on adjacent buildings. At the completion of the excavation, the maximum displacement recorded was 15 mm on the southern side of the excavation. The critical George Street survey points showed up to 4 mm of displacement. The drawing at right shows maximum displacements. Inclinometers , shown in the drawing, were installed along the George Street face to monitor movements adjacent to the tunnels and measure shear movements along major bedding horizons. The maximum displacement recorded by the inclinometers was 6 mm toward the excavation at a level corresponding with a bedding parting. Contrary to expectations, displacement plots often showed movement away from the excavation in the upper half of the wall. However, this was generally consistent with survey data and was attributed to a combination of stressing of anchors and stress-relief effects due to the construction techniques used when the tunnels were constructed. Incremental displacements between readings were small, consistent, and assessed to be accurate. Load cells were installed on the collar of selected ground anchors along George Street. Problems had been reported by others in achieving adequate anchor loads during construction of the Coopers & Lybrand Tower, on the other side of George Street. Initial loads showed a decrease but then stabilized. Tunnel survey points were installed in the lining of the railway tunnels. Monitoring stations were set up at three locations along both the upper and lower tunnels next to the excavation. The maximum lateral displacement of the walls was 8 mm, and the maximum downward displacements of the roof were 3 mm. A tape extensometer to was used to monitor tunnel convergence. Maximum displacements at three locations were between 1 mm and 4 mm divergence (dilation). Vibration monitors were installed to ensure that maximum velocity did not exceed 20 mm/s during construction of the pile wall, installation of ground anchors, and the excavation process. The Genting Centre excavation was successful. Some minor cracking was observed in adjacent buildings, but once filled, no further opening was observed. The finite element modelling adequately represented the overall deformation pattern and provided guidance for safe and efficient excavation and construction. Actual movements recorded by the instrumentation were smaller than predicted, and all displacements were within acceptable limits. Instrumentation proved to be a cost-effective investment. The structural engineers on the project were Taylor, Thompson, and Whitting. The excavation contractor was Ward Civil Engineering. The owner of the site is Genting Australia Investment Holding Pty Ltd. Thanks to Golder Associates, Australia for this story. It is excerpted from a technical paper entitled, "Genting Centre, Sydney - Deep Excavation Adjacent to Railway Tunnels" which was presented at the 8th ANZ Conference on Geomechanics in 1999. Golder Associates can be contacted at 88 Chandos Street, St Leonards, NSW 2065, Australia. Tel +612-9439-3611, Fax +612- 9436-0693, www.golder.com .